Come and have fun with us in the woods! Moors Wood is a 3 acre private mixed broadleaf deciduous woodland between Hereford and Ledbury, close to Marcle Ridge, in the county of Herefordshire. It was planted in 1991, with a further phase added in 1992. Moors Wood is organically managed as a sustainable resource for the benefit of the local flora and fauna and is a private nature reserve. and lots of shrubby areas and open areas. There are many natural features and natural materials available for play and learning. 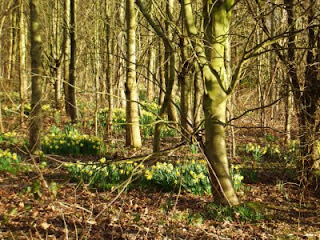 The site is enclosed, safe, thoroughly risk assessed and managed by a first aid trained, insured, Forest School Leader. Our house at Moors Wood is powered mostly by renewable energy: we have a 30 tube Solar Thermal installation for hot water, 14, 185 W Photovoltaic panels which produce electricity for our use and to sell back to the national grid, a woodburner which exclusively burns our own wood from Moors Wood. We also have our own water supply and sewerage system. We do use an oil boiler ( mainly in the winter), but our usage is dropping all the time, as we improve insulation and reduce energy loss by various means! Longer term plans include building a composting toilet in the wood and also a low impact building for use as a classroom and store room. Moors Wood site was arable farming land before being planted with trees, although an ancient hedgerow runs down the boundary between the first and second area to be planted. Within this hawthorn hedge are several old Oak trees (in excess of 200 years old by the girth of the trunk.) This ancient boundary now lies within the new planting. The wood was planted by the previous owners of our smallholding, funded by the Forestry Commission English Woodland Grant Scheme. Planting was an intimate mixture of 25% Oak, 25% Sweet Chestnut, 10% Ash, 10% Birch, 10% Small leaved lime, 10% Wild Cherry and 10% a mixture of others. Each whip was protected by a cane and a spiral rabbit guard. The purpose of the planting of Moors Wood in open countryside was to have an important, enhancing visual impact in the landscape, create a host of habitats for wildlife and, in the longer term, produce some wood. We purchased the property in 1997, mainly because we fell in love with the woodland. As well as the tree planted area itself, there is also a small meadow area and wildlife pool. 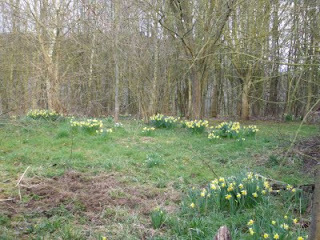 We manage this land organically, for the benefit of our wildlife visitors as well as ourselves. We carry out traditional woodland management for wood products, such as firewood and beanpoles, we also coppice to ensure a supply of wood products in future years. We harvest nuts and other wild foods as the season allows.We have also used our woodland for education and enjoyment since we moved here in 1997. Moors Wood had a canopy of Ash, Silver Birch, various Oaks, Wild and Bird Cherry, White Poplar, Sycamore, Sweet Chestnut, with an understorey of Small leaved Lime, Hornbeam, Hazel, Hawthorn, Cherry, Holly and taller coppiced former canopy trees. The shrub layer is mainly Hawthorn, Spindle, Mistletoe, Blackthorn and smaller coppiced stools and growing saplings. The field layer has Nettles, Rose bay willowherb, Ferns, wild Honeysuckle, Brambles, Ivy, wild Rose, wild Daffodils, Bluebells, Dog violets, Primroses, Ransoms, Wood Sorrel, Buttercups, Arum lilies, Cow Parsley, Wood Spurge, Bugle, Cowslips, Dogs Mercury, Early purple orchids, Wood Avens. The ground layer is made up of Celandine, mosses, Ivy, and Lamiastrum. This is by no means a complete list as every year when I record what is there, something else has appeared naturally. Moors Wood is full of wildlife. We have a huge variety of insects and other invertebrates and the presence of the pool and meadow means we have many dragonflies and damselflies, butterflies and moths. We have newts, frogs and toads as well as slow worms and grass snakes. Moors Wood is home to a huge variety of bird life. We have put up many bird boxes and every year they are filled with nestlings. Barn,Tawny and Little owls hunt in the wood. A buzzard family nests in the big Oak tree part way down the wood and we have several different birds of prey hunting most days. We have several different species of bat, we have seen dormice and the Wood is full of yellow-necked mice, as well as the more usual shrews, wood mice and other small mammals. Badgers use our wood to forage in and to dig latrine pits. We are sited on the boundary between 2 overlapping badger territories so we have no setts in the Wood but occasionally we find a juvenile has had a go digging a hole and we frequently find snuffle pits where the local badgers have been foraging for worms. We obviously use our wood as a Forest School site and also provide environmentally themed parties and play sessions during the school holidays. Practitioners from Early Years and School settings visit us for training courses as well. We also work and manage our woodland for timber and other supplies. We coppice trees, particularly Hazel and Sweet Chestnut, although we have found Ash will also coppice. We provide wood from our coppiced hazel for chair and obelisk making and yurt frames and we harvest poles from the wood for use as beanpoles. We fell trees every winter, taking care to select trees which will allow regeneration of the ground layer around them. We use the wood as a source of logs to heat our home in the winter, using a woodburner. 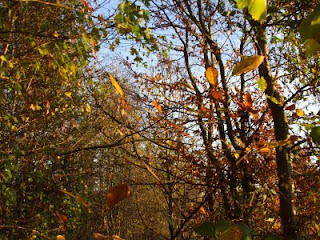 The woodland is a major source of leaves for leaf mould making in the autumn, to then be used as a soil improver in our organic garden. The wood provides shelter from the winds for the garden and orchard (permaculture principle) we harvest nuts and berries in the autumn and salad leaves in spring and most of all enjoy our wood as a wildlife haven in an area of intensive agricultural management. Moors Wood is an example of a small-scale woodland being integrated into a family lifestyle and managed in a Permaculture inspired, Organic, sustainable way. Moors Wood provides us with renewable, sustainable resources for our current needs. Hopefully we are, in return, ensuring Moors Wood has a healthy, long-term future.